selects four pebbles and uses them as a concrete way to represent positive feelings. 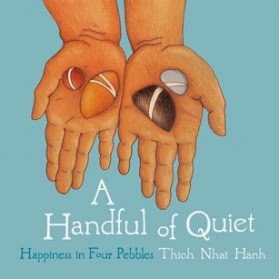 Pebble Meditation has also been made into a separate, child-sized illustrated book: A Handful of Quiet. (This is another recommendation on Ms. Srinivasan’s list of Best Children’s Books). Not that the children's behavior is always fun or helpful for the teacher! Just as important as the instructions themselves are the examples of handling unforeseen problems: Despite our best intentions, we inevitably do have to deal with things like kids who disrupt activities, kids who refuse to participate in activities, or utter chaos when an insect flies into the room. But in all of these cases, we can choose to respond in a way that's calm and compassionate. 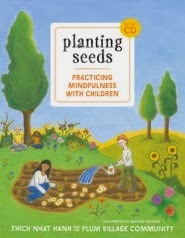 By nurturing the positive "seeds" in ourselves, we provide powerful role models for our students as they learn and grow.